A 3-month-old baby is among those who have died in the crash at 29th Avenue and Bethany Home Road, police say. PHOENIX — Officials say two adults and a baby are dead, and three firefighters are injured after a serious crash that caused a fire truck to roll over in west Phoenix Sunday morning. The fire engine was on its way to an emergency fire call when it collided with a pickup truck at 29th Avenue and Bethany Home Road shortly after 9 a.m. Sunday, Sgt. Vince Lewis with the Phoenix Police Department said. The fire truck had its lights and sirens on. The Phoenix Police Department said a man died at the scene of the crash, while a woman and a 3-month-old baby were pronounced dead after they were transported to the hospital. All three of those who died were in the pickup truck. Police believe it was a family. All three injured firefighters were taken to the hospital, two of them initially in critical condition but the police department says all three firefighters are now stable. One was released from the hospital Sunday afternoon and the two others will remain in the hospital overnight for precautionary reasons. It is uncertain how the crash happened but photos from the scene show the fire truck on its side and off the roadway. Police said the truck rolled three times. Sgt. Lewis said it appears, preliminary, that the pickup truck turned left in front of the fire truck, though investigators are still working to determine how the crash happened. 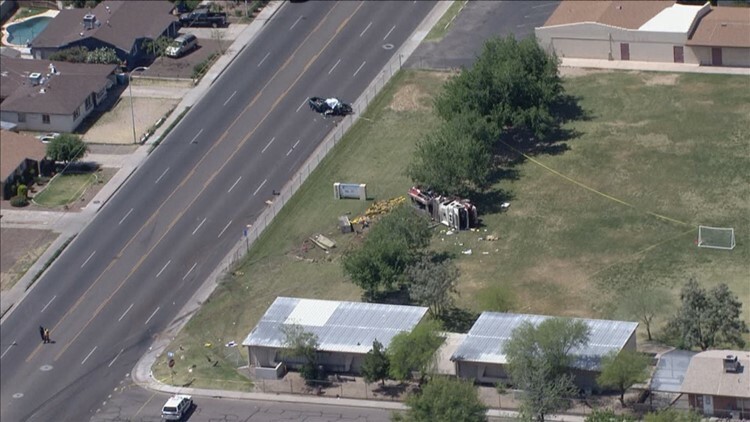 A man, a woman and a 6-month-old died after the pickup truck they were in collided with a Phoenix fire truck near 29th Avenue and Bethany Home Road, police say.